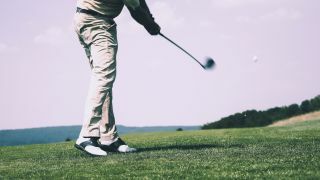 Managing to schedule a tee time that coincides with good weather is a miracle in itself, so the chances that you’ll be able to perform to the best of your Jack Nicklaus-channelling ability in the face of that spectacularly sunny weather are set to be even slimmer. But not to worry, because that’s where the best sunglasses for golf come in. After our quick pick? No time to faff around in the pro shop (although we know you will anyway)? Go for the Oakley Half Jacket 2.0 XL, our best golf sunglasses all round. They offer the big-ticket attraction of golf-specific sunglasses – that is, much higher clarity and contrast courtesy of polarised lenses – in conjunction with lightweight comfort and the option for interchangeable lenses. A wide, curved lens style like this is great for ensuring that every inch of your peripheral vision is covered and no sneaky glare will derail your game, but wraparound styles and single-lens sunglasses like the Dirty Dog Edge can get a little steamy on hot days. Consider something like the Tifosi Optics Camrock frame, with its in-lens vents, which allows for better airflow close to the face. For their double whammy of clarity and comfort, these half jacket golf sunglasses by Oakley are our top pick for sunny days on the course. The polarised lenses help to emphasise the contrast on the green and nix any distracting glare while you’re lining up for a shot, and the option for interchangeable lenses makes these a great versatile option for all weathers. Meanwhile, the O Matter frame remains outrageously light and comfortable over the course of the day, and looks pretty good while doing it, making these our best all round. Another super-clear offering from the big brand? Oakley dokily. Two Oakley frames on the trot? You’d better believe it. There’s a reason sports sunglasses have a go-to in this established brand, and it’s epitomised in the Flak 2.0 Prizm. Phrases like “patented High Definition Optics” and “Prizm technology” might just sound like marketing chatter, but expert testers attest that in these lenses, they make for unparalleled clarity and contrast, and really come into their own in changing light conditions. At just 24g, they feel pretty light on the face too. Such a gnarly name hardly seems befitting of golf, but rave reviews show that these sunnies aren’t to be sniffed at. The blue-tinted lenses of these sport sunglasses are designed to block out the brightest of light, making them especially useful for midday tee-offs and days when there’s not a single cloud in the sky. They’re also engineered to stay put no matter what Happy Gilmore-style shenanigans you might pull, with non-slip tips and durable scratch-resistant lenses. This Bloc Titan pair is pretty pared-back, as specialist sports sunglasses go, with a sleek black frame and curved half-frame lenses that are engineered to sit sensibly on the face. In fact, for those half questioning whether they need golf sunglasses at all, these sub-£40 frames are arguably the perfect option: lightweight so as not to be felt, with interchangeable lenses for different weathers, and an adjustable nose piece to see off that pinching discomfort that might throw you off your game, all for a great, justifiable price. Not everyone likes a full-on wraparound lens. If you’re one of those, why not try these Tifosi Optics sunglasses on for size? Reviewers with more generously sized heads found that these fit a treat, and the fact that the lenses themselves are a little narrower than the average offerings also helps to keep them from steaming up, although we suspect the vented design facilitated by a small corner window in either lens might have something to do with that too. These are also the closest thing to non-sport sunglasses on our list while still providing the functionality, making them a very versatile pair.